Around the time I decided to start WORN, I had a job in a quiet bookstore. My co-worker, an appropriately cynical punk girl, asked me what I was always scribbling in my notebook. I told her I wanted to start a publication about fashion. Her response wasn’t exactly rude, but she was far from impressed. She told me fashion had no part in her life, and that it was stupid, vapid, and a waste of time. That made me smile. I pointed out the brands of workwear she preferred. Her Converse predated Nike ownership of the brand, and she knew how to tell. I noted the way she visibly repaired her clothes with dental floss rather than thread to last longer and the silk-screened protest patches and band buttons that covered her knapsack. She used clothing to tell the world her values and establish her place as part of a community and subculture. By the time I was done she had to agree: she actually cared a whole lot about fashion. People imagine there is this thing called Fashion with a capital F. That it’s a sub culture guided by its own particular set of rules, behaviours and aesthetics. Inherent in this is the idea of exclusivity. A binary develops: good, bad; in, out; fresh, so five minutes ago. What is chosen and who can choose it is constantly shifting and never fully established. It’s understandable that people are afraid of being told they are doing it wrong, when it’s practically impossible to figure out what “it” is. Worse yet, magazines take advantage of that vulnerability, telling readers they need to have the newest bag, cut of jeans, or skin cream to be acceptable (all conveniently provided by advertisers). Not to mention the systematic exclusion of anyone who isn’t young, skinny, cis, and white. And then there’s makeover TV. And luxury brands. And sweatshops. And and and. The fashion industry is riddled with problems. It makes me mad; I get all sizzly inside. WORN is how I respond to that. Because why not make fashion the way I love it, celebrating the good parts rather than spending my time pointing out the bad ones? Instead of telling people what to do, why not give them a choice and provide an alternative? Because fashion, oh, fashion. Fashion is all the other things. It’s the how, what, and why of people covering their bodies. We’re all born looking one way, but we don’t have to stay that way forever. Fashion lets you become whoever you want to be. Fashion made me who I wanted to be. When I went to art school, and I was fascinated by how my fellow students’ clothing acted as an extension of their paintings and sculptures. I worked for a few years at a modelling agency and saw the Fashion-with-a-capital-F industry from the inside. I spent some time in vintage, where I met one of the most interesting women I’ve ever known, who would regularly throw tidbits of utterly fascinating fashion information at me while we unpacked boxes of ’70s cycling jerseys and hand-tooled leather purses. I worked at a media retail empire filled with very nerdy music and film fanatics, obsessed with knowing everything about everything they loved. A lot of people are surprised when I tell them I’d never worked in publishing; they ask me how in the world I came up with the idea of starting a magazine, but it was that all these things came together in my head. I wanted to understand the connection of aesthetic and clothing outside of trend and reconcile my problems with the fashion industry with my love of clothes. I wanted to know everything about everything I was interested in. I’d been reading my husband’s music magazines, and they would have 30 page articles about concerts that happened decades earlier. There was no equivalent in fashion publishing—but as I worked in that quiet bookstore, I realized I could change that. So I called up that brilliant girl I knew from the vintage store, and she became our managing editor. I posted a flyer asking “Do you love fashion, but are frustrated with fashion magazines?” I added my home address and held a meeting in my living room. A few strangers showed up, and one of them is our senior editor and an encyclopedia of fashion history. I scoured Montreal for talented friends and strangers. Then we started a magazine. We made it up as we went along. Some things would have been good to know earlier on, but many of the things that we did our own way became an important part of WORN. Instead of using professional models in photo shoots, we used friends and staff members. Instead of designer clothes, we pulled things from our closets and from local vintage stores. We refused free promotional products, and for the most part, refused to talk about products at all. We didn’t report on trends or tell people what to wear. Instead of looking to the runways for inspiration, we encouraged people to look at old pictures, or fictional characters, or ’60s pop stars. We wrote articles exploring how fashion related to feminism, performance art, and the washing machine. As time went on, people began to ask how they could be a part of the publication. That’s when we introduced the idea of the Wornette. Jane Magazine had a big influence on me, and I loved how the writers were like characters in the cast of the magazine. I also loved the Ramones, and how they created a family by giving themselves all the same last name. It was what I wanted WORN to be – a family of people who worked on this little project of love. Wornettes are not just girls; they can identify as any gender or none at all. Wornettes are not just interns; they are anyone who supports WORN, whether an editor-in-chief or an Australian teenager with a knee sock addiction and a mailbox. In the beginning, it only applied to those who worked for us, but as we grew the definition grew with us. Want to be a Wornette? You already are. I’m a few years into this and I find myself giving talks to high school and university students. The first thing I usually ask is if anyone has had a fashion magazine make them feel bad about themselves. The answer is sadly, consistently, a sea of raised hands and nodding heads. I started WORN because I didn’t think it had to be that way. That doesn’t need to be the dominant relationship we have with fashion. We can do better. In these pages, we’ve collected the very best of the first seven years of WORN. We revisited and re-edited our early pieces, applying the lessons we’ve learned. It was interesting and, frankly, a bit shocking to see how far we’ve come. The WORN Archive collects articles and photo shoots from our first 14 issues and grouped them together to show how WORN talks about style, and how we can examine, and celebrate, and learn from it. Fashion is personal, it’s practical, it’s history, design, object, art, identity, ideas, and fun. Fashion is WORN. You can order The WORN Archive: A Fashion Journal About the Art, Ideas, and History of What We Wear (ISBN 9781770461505) from Drawn & Quarterly, or ask for it at your local independent bookstore. You can get it on Amazon too, but the other options are so much nicer. Founded by Serah-Marie McMahon and first published in Montreal, Canada in 2004, WORN was created to address the lack of thoughtfulness in mainstream fashion magazines. It claimed that you could truly love clothing even if you were disinterested in the commercial industry of “fashion”. Over the years we covered topics such as the science of drycleaning, the role clothing plays in creating identity in the trans community, the evolution of flight attendant uniforms, and photoshoots devoted to styling moms. In May of 2014, Drawn & Quarterly published a compilation of the best of our first 14 issues called The Worn Archive: A Fashion Journal About the Art, Ideas, and History of What We Wear. After 10 years and 20 issues, WORN Fashion Journal published its last issue in December of 2014. 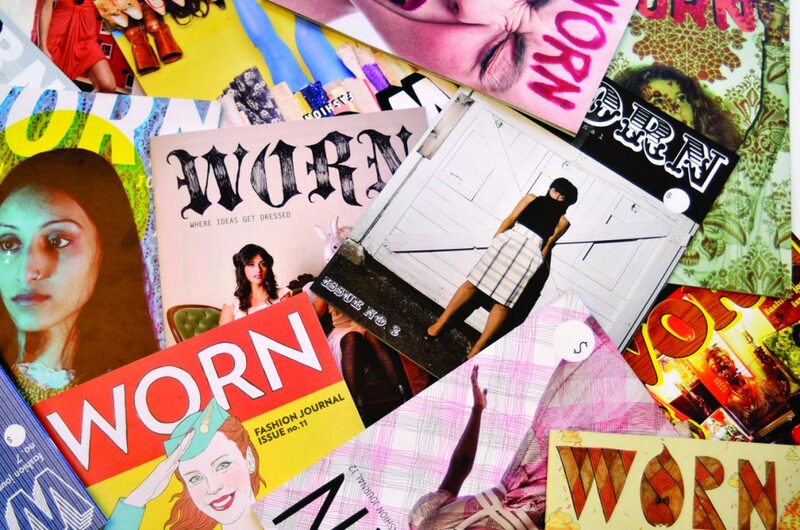 You can buy many of the WORN Fashion Journal issues online from our Etsy store The House of WORN. You can buy The WORN Archive on the Drawn & Quarterly website, or from your local independent bookstore.